Gorgeous lakefront home nestled on 2.2 very private acres. 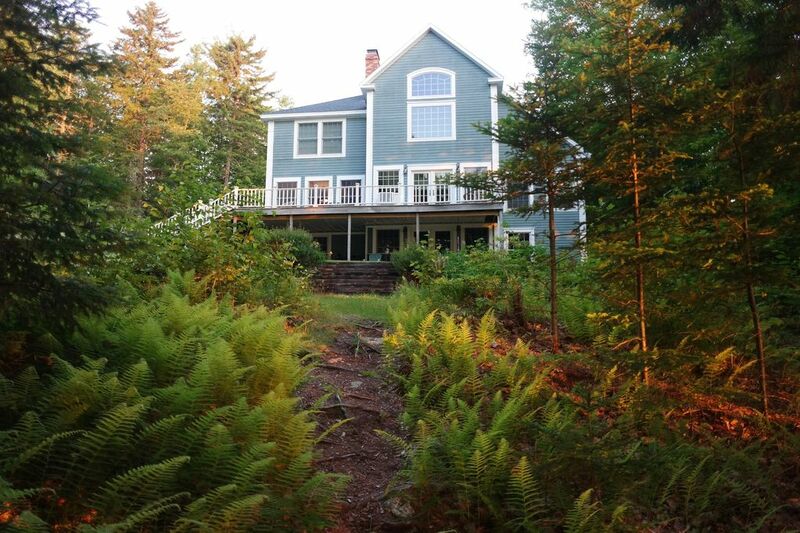 With over 250 feet of frontage on Toddy Pond, the house sits 75 feet from the water, atop a small rise, providing a lovely view of the lake through the trees. Toddy Pond is one of the most desirable lakes in downeast Maine. The charming oceanfront town of Blue Hill is only 15 minutes away, with Acadia and Bar Harbor about a 45 minute drive. This year-round home is well appointed, with a gourmet kitchen, luxury master suite, and maple floors throughout. The living, dining, and kitchen areas share an open floor plan, anchored by a massive granite fireplace, providing a very spacious feel, even for larger groups. A spectacular arched window casts a sunny disposition in the living area throughout the day. When we moved from Boston to the South in 2002, we had a dream about retiring to Maine some day. When we stumbled on this lakefront gem, we knew it was destiny. It's so quiet and peaceful, but lives like a "real house" not a lakefront cabin or something. We were smitten and the rest is history. The way the house sits elevated above the water, with the huge deck looking out through the trees at the lake is just spectacular. You could just sit on the deck for hours. The fact that it's situated in a cove is just a bonus -- the cove is always calm and perfect for swimming. Finally, the living area is just spectacular -- a two story living room with a massive granite fireplace and huge wall of windows facing the lake makes every day a beautiful day. Over 200 ft of frontage on Toddy Pond -- the most pristine and quiet lake in the area. Just a few steps down to the water's edge. Great swimming to submerged boulders in the cove. Unlimited long distance calling within the US. ATT 4G Internet Provided. Works great. 5 GB limit per week please. Awesome stay in Loon Cove ! The house is very pleasant and comfy. We really enjoy out stay ! It s a good spot to discover Acadia park, specially during foliage. Dan was very nice and welcoming. We really enjoyed our stay! Travelled with a group of friends and had a great time at the house. Enjoyed playing ping pong, grilling and relaxing by the lake. Would highly recommend. The house is hard to locate the house though (specially at night), since it is down a small country road. We stayed here for 3 nights for a girls’ weekend. There were 5 of us, and the home was absolutely perfect for our reunion! It was very well appointed and very comfortable. We really only spent evenings in the house (so much to do in the area), so we never took advantage of the lower level game room, or the tv, movies, and games. Great kitchen and living room, and plenty of beds for our group. The only awkward configuration of the home is that there is only one bathroom on the second floor, which is only accessible through the master bedroom. Other than that minor thing, we LOVED this home. Would definitely stay here again! We loved the setting on Toddy Pond. So peaceful and private. The only sounds you heard were the loons on the pond! Highly recommend! If you are looking for relaxation, downtime, and some peace and quiet; drinking your coffee or tea on a deck with a view of an awesome lake and trees, this is the place for you! The views are just spectacular, and the scenery is just beyond gorgeous. This lakehouse was perfect!! Will go back soon!! We had an amazing stay at Loon Cove. Our trip started out in Portland ( Bon Appetite's restaurant city of the year and rightfully so) with a visit to the Cape Elizabeth Head Light. From there we referenced the owner Dan's, "Toddy Tips", a detailed and very handy reference guide with directions and information on all the great little towns and places to visit. We opted for the slow scenic route up with stops at LL Bean in Freeport, a visit to Maritime Museum in Bath, a stop for shopping and groceries in Belfast. Upon arrival at Loon Cove we found everything as advertised. A beautiful house with all the amenities you could wish for in a vacation rental. Our kayaks, rented from the nearby Activity Shop, were waiting for us. Within minutes we were unpacked, exploring, kayaking and fishing. Toddy Pond is as gorgeous as it gets. We had the good fortune of near perfect September weather. Upper 70's, even 80. Low 60's in the eve. No rain. Having traveled to the Mt. Desert area in the past, I found Loon Cove to be perfectly located. Bar Harbor and Acadia National Park areas were easy to get to as well as all the less tourist-ed but very cool little towns in the area. We visited Blue Hill, Southwest Harbor, Bass Harbor, Belfast (a 2nd time), Deer Isle, with the little ocean town of Stonington as our consensus favorite with its old weathered buildings, art galleries, used book, antiques and quaint coffee shop. Every morning we were awakened with a lobster red sunrises. Every night we fell asleep to the sound of loons calling. I highly recommend staying here for your next trip to NE Maine. You will not be disappointed! Had a fabulous time at the house. Spent a lot of time sitting on the dock listening to the loons. We rented a canoe for the week and caught a ton of bass and sunfish. Great place for a family get together.